On arrival on Rinca island there is the possibility to do a two hour trekking around the island with a ranger from the National Park. 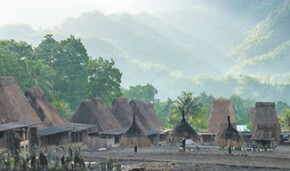 During this trekking we hope to come across the Komodo Dragons, monkeys, deer, wild pigs, wild buffalos and many birds. Afterwards there is time for a cold drink in the restaurant before the boat leaves for Bidadari Island. We will have lunch on the boat and there is time for snorkeling. In the afternoon we will arrive again in Labuan bajo. After breakfast we go to the traditional village Bena. After that we continue our trip to Ende. Just before entering the city of Ende we visit the Blue Stone Beach. On this beach and in the surroundings you can find the nice shaped blue stones.In Ende we have lunch. In the afternoon we drive up to Moni to find accommodation for the night. After dinner there is time to see the traditional dance of Moni/Ende.